Are you struggling to find IT budget to drive new business initiatives? There are many things you can do within the AWS console to drastically reduce your monthly AWS spend. 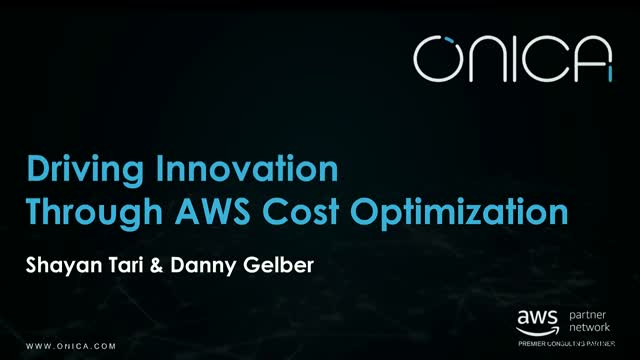 Join us for a webinar on tips and tricks to better optimize your AWS console and free up IT budgets for projects that drive innovation and move the business forward. - What are three-year convertible and Reserved Instance families and when does it makes sense to leverage them? Although people think about Serverless and Containers as distinct, the reality is they’re not too different from each other. When looking at the workloads, the microservice requirements, and the new AWS re:Invent service releases, this becomes more clear. First, however, it’s important that we break down the definitions of Containers and Serverless before getting into the commonalities and how the two are merging. Join Kevin Epstein, Onica's Chief Architect in Customer Solutions as he takes you through his thoughts on the subject. Learn how AWS can accelerate your IoT strategy by allowing for rapid IoT prototyping in less than 6 weeks. By leveraging AWS' connectivity, storage, application, and analytics capabilities, you can build IoT-enabled apps quickly and at a fraction of the cost. We'll cover serverless IoT architecture as well as do a live demo on how to connect & configure devices on AWS IoT Core. Didn't make it to re:Invent 2018? Missed some of the key announcements? We got you! Join us for our 60 minutes webinar which will take you through key new AWS announcements including AWS RoboMaker, AWS Timestream and AWS IoT Events hosted by Onica's Matt van Zanten, DevOps Engineer. -New management & governance services like the AWS Well-Architected Tool, AWS Control Tower and AWS Security Hub that make it easier for users to take on AWS on their own. Join us for a webinar on leveraging IoT and Predictive Analytics utilizing AWS. IoTanium boards combined with AI/ML and Amazon SageMaker allow users to make better data driven decisions. Learn how Onica enabled one of our customers to enact a digital transformation of their non-technical workforce into an augmented workforce with Amazon Sumerian. - Amazon Sumerian to create and run VR, AR, and 3D apps quickly and easily without requiring any specialized programming or 3D graphics expertise. Join Onica and Amazon Web Services (AWS) for a webinar focused on migrating Windows workloads to AWS and running .NET applications in the cloud. Whether you're running Microsoft Windows, SQL Server, Exchange, SharePoint, or custom .NET applications, you can rely on the secure global infrastructure of AWS to easily run any Microsoft Windows Server application in the cloud. We’ll discuss the various benefits running Windows workloads on AWS bring such as cost savings and reliability as well as how to reinvent your business with accelerated innovation through Windows automation and faster .NET application release cycles. • Customer success story: Learn how Onica enabled a leading provider of technology-enabled financial solutions to deploy and re-deploy their 150+ Windows applications within minutes, greatly contrasting with an average pre-migration release window of 8.5 hours. Join Amazon Web Services (AWS), California Polytechnic State University (Cal Poly), Onica and CloudCheckr for an exclusive, invite-only event to explore how higher education entities are optimizing IT spend and leveraging the power of the cloud to boost research and innovation, develop student talent, increase academic engagement, and modernize your IT team’s skills. Cloud Trends in Higher Education: From migration strategy to virtual desktops, disaster recovery, and infrastructure optimization, Michael Dobe, Ph.D., Senior Consultant at AWS will present on cloud trends in the higher education space and findings from leading dozens of cloud transformation projects. Case Study: Cal Poly Goes All-In on AWS: Ryan Matterson, Deputy CIO at Cal Poly discusses how Cal Poly, a nationally ranked university expects to save $3.5 million over three years by migrating to the cloud. Higher Education Offerings & AWS Funding Opportunities: Kevin Epstein, Chief AWS Architect and Evangelist at Onica and Alana Fitts, Director of Sales Strategy at CloudCheckr will discuss business challenges facing higher education institutions and possible solutions, including optimizing the costs of maintaining legacy systems, effectively aligning future IT investment priorities with critical business outcomes, getting organizational buy in for IT initiatives, the first steps to cloud adoption, and recruiting and developing the relevant IT skills and capabilities necessary to support the modern day higher education institution. Whether you’re using IoT to remotely control a device, track devices in the wild, or collect and predict performance and failures, you’ll need the power of AWS. By leveraging AWS' connectivity, storage, application, and analytics capabilities, you can build IoT-enabled apps quickly and at a fraction of the cost. - Storing data in Amazon DynamoDB and Amazon S3. FRAC-CHEM sought to track the performance of fracking hydration units in remote field locations. Onica developed an IoT Device, software, infrastructure, and application to collect, transmit, parse, and store data. A real-time dashboard was integrated on-site allowing full transparency into deployed hydration units. Alistair Group needed a solution to manage their group of contractors, drivers, trucks, trailers, and load assignments. We helped build a proprietary serverless application connected to IoT devices on the trucks to manage their subcontractor fleet. The new application streamlined and automated their operations process. DevOps Transformation is more than just a CI/CD Pipeline, it is transforming your business to a DevOps culture. A DevOps transformation integrates the adoption of DevOps automation tooling and an organizational DevOps mindset. Together these methods revolutionize the ability of an organization to enact changes to their team for great efficiency. Servers are fading into obscurity. Instead, the model of “Run code, not servers” is prevailing, spurring a cloud native mindset where developers consider infrastructure and integrations from day one. Join us to learn how AWS makes fault-tolerant, auto-scaling, and self-healing systems a reality for application development with their Serverless offerings. Build, test, and deploy with lower fixed costs and no single points of failure. For any company using Kubernetes as a core to their IT strategy, you’re probably running hundreds of millions of containers on AWS every week. Amazon EKS simplifies the process of building, securing, operating, and maintaining Kubernetes clusters, and brings the benefits of container-based computing to organizations that want to focus on building applications instead of setting up Kubernetes clusters from scratch. Amazon Elastic Container Service for Kubernetes (EKS) is a platform for enterprises to run production-grade workloads. EKS makes it easy to run Kubernetes by fully managing the Kubernetes masters and etcd for you. In this webinar, we'll show you how to get started with Amazon EKS including how to seamlessly migrate your Kubernetes workloads to EKS as well as tips & best practices we’ve learned during the EKS preview. Please join Onica and AWS for a webinar focused on migrating Windows workloads to AWS and running .NET applications in the cloud. Whether you're running Microsoft Windows, SQL Server, Exchange, SharePoint, or custom .NET applications, you can rely on the secure global infrastructure of Amazon Web Services to easily run any Microsoft Windows Server application in the cloud. We’ll discuss the various benefits running Windows workloads on AWS bring such as cost savings & reliability as well as how to reinvent your business with accelerated innovation through Windows automation & faster .NET application release cycles. •Customer success story: Learn how Onica enabled a leading provider of technology-enabled financial solutions to deploy & re-deploy their 150+ Windows applications within minutes, greatly contrasting with an average pre-migration release window of 8.5 hours. Join us to learn about the benefits of containers on AWS and how they can help you create consistency, gain operational efficiency, and improve productivity. We'll cover Amazon ECS, Amazon ECR, Amazon EKS and Fargate. Containers on AWS are a major resource for developers looking to improve infrastructure efficiency. Watch our webinar to learn several techniques for deploying containers on AWS. We’ll discuss the pros and cons of differing approaches, and explore a live demo. Learn how AWS can accelerate your IoT strategy & help you make impactful, data driven business decisions. Why consider IoT for your business? Learn how IoT can create new customer experiences and streams of revenue by connecting the real-world to the virtual world, enabling your business to make impactful, data driven decisions. We'll discuss IoT adoption across industry leaders including trends, use-cases, and cloud native innovation around data lake analytics. Why AWS for IoT? Whether you’re using IoT to remotely control a device, track devices in the wild, or collect and predict performance and failures, you’ll need the power of the Amazon Cloud. By leveraging AWS' connectivity, storage, application, and analytics capabilities, you can build IoT-enabled apps quickly and at a fraction of the cost. We'll cover device connectivity, security, data management, compute options, and analytics tools. Customer Success Story: Learn how FRAC-CHEM collaborated with AWS and Onica to rapidly deploy sensor-enabled equipment to capture, store, and visualize real-time operating data. This initial experiment helped transform FRAC-CHEM's entire business model from a chemical supplier to managed services provider. Are you struggling to find IT budget to drive new business initiatives? There are many things you can do within the AWS console to drastically reduce your monthly AWS spend. Join us for an educational event where we’ll teach you tips and tricks to better optimize your AWS console and free up IT budgets for projects that drive innovation and move the business forward. The cloud promised to save you money, but your cloud bills may have actually increased. To truly leverage the cloud, you need to adopt a Cloud First attitude, using innovative ways to compute while preventing Cloud Sprawl. Tools like CloudCheckr can help you optimize costs along with experts from CorpInfo-Onica who can help you make the right architectural and technology decisions with technology. Onica is one of the largest and fastest-growing Amazon Web Services (AWS) Premier Consulting Partners in the world, helping companies enable, operate, and innovate on the cloud. Our webinars will provide insight, best practices and tips, gathered from years of AWS experience, on topics from migration strategy to cloud application and data engineering solutions.